There are scores of varieties of wild lettuce, each with a different leaf shape and growth habits. 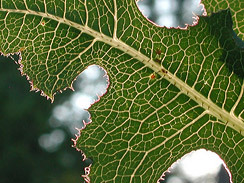 Some have long thin oblong shaped leaves, some deeply variegated leaves with tips in the shape of a card deck’s spade suit. At different growth stages, the plant structure varies from 8″ tall leaf clusters growing directly from the soil, to leaves splaying out from 3′ tall stalks. Here in my SoCal hills, I harvest at least three kinds. What they all have in common is a row of small hairs growing along the center rib on the leaf’s underside, and a white sap that oozes slowly from cuts on the plant’s stem or leaves. Note that wild lettuce is one of only a handful of edible plants that oozes white sap; white sap is usually a sign of toxicity in plants. Wild lettuce is one of the first greens to sprout up from the soil in early Spring here. When that happens, I find entire slopes covered with the young plants. In early growth stages, the leaves are tender to the tongue and tasty. As the plant ages and grows tall, forming a central stalk, the taste becomes much stronger shifting towards bitterness as the sap content increases. 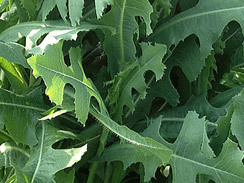 The botanical name is Lactuca virosa, other names include Bitter Lettuce, Laitue Vireuse, Opium Lettuce, and Poisonous Lettuce. 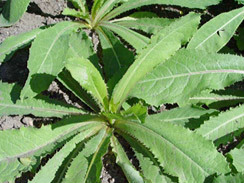 Wild lettuce’s white sap, when consumed in high doses, has slight psychotropic effects. The effects are sedative or hypnotic, oft compared to a very mild opiate. Distillation or sap concentration is required for those effects, so it’s likely impossible to feel the effects by eating the leaves. Collect young tender wild greens in first few weeks of plant growth. Prepare all ingredients as you would a domestic salad. Toss in large bowl and season with your favorite dressing.